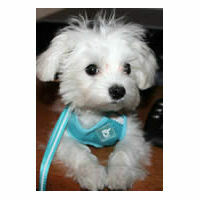 The EasyGo Harness & Leash Set is an easy to use all-in-one no-choke solution that's comfortable for your small dog. You can earn 20 Golly Gear Rewards Points on this product! 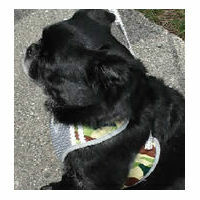 The EasyGo Harness by Dogo is an easy to use and comfortable all-in-one harness solution for small dogs! 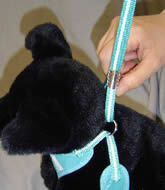 The leash is already attached, and the harness adjusts in seconds for a perfect fit every time. 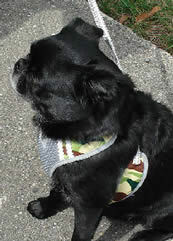 Scroll down to see a short video of Fran putting the Sailor EasyGo Harness on Booker, 6 month-old Boston Terrier puppy. 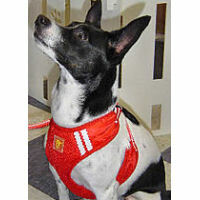 The front of the EasyGo Harness and the lining is soft, slightly padded mesh jersey. The sides are smooth satiny polyester. 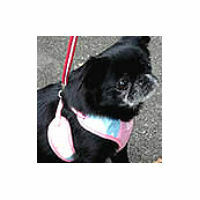 The EasyGo Harness is washable in cold water. Practical, simple and stylish! 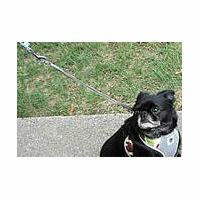 Here's a short video of Fran putting the Sailor EasyGo Harness & Leash Set on Booker, Boston Terrier, when he was just a 6-month old puppy.